The IPCC flip flop on year 2100 temperature projections | Watts Up With That? Andrew Montford at Bishop Hill recently posted links to the AR5 second order draft materials and comments dated March 28th, 2013. With those available it allows us to begin constructing a timeline of how the finalized documents were hammered out. 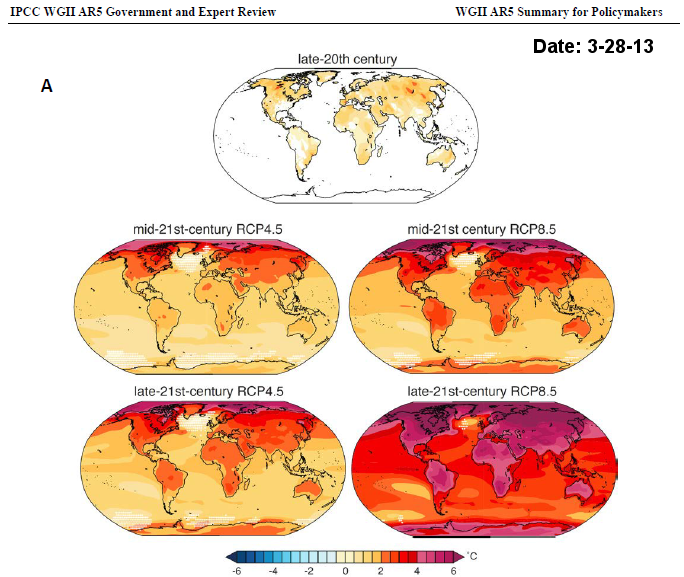 One of the first things I noticed, was that the temperature projections to the end of the 21st century went through a flip-flop in the evolution of the Summary for Policymakers (SPM). Note the scale goes to 11°C on the RCP 8.5 map, with the Arctic seeing the greatest warming in that range. But back in March 2013, the same section of the Second Order draft SPM had a RCP 8.5 figure projecting about half of the warming of the final SPM draft and the SPM release, and a scale that only goes to 6°C. See the lower right map for “late 21st century”. So, it seems that early opinions in the SPM in 2013 were more conservative, perhaps in response to all the press coverage “the pause” has received, and then as pressure mounts from all the players as the deadline looms, they went back to high end projections. I’m sure there’s quite a back-story that will be revealed once the reviewer comments are examined. For more on the RCP model, you can visit the web page and run plots yourself. Registration is required to get the data. UPDATE: Gavin Schmidt points out on my Twitter feed that the difference comes from the two different working groups, WG1 and WGII. But, what of the difference in opinion on year 2100 projections; certainly that represents a non-consensus? Was WGII giving a minority report with their lower numbers? ← What would the IPCC have written if there had been 12 years of rapid warming? Clearly the science was in flux all year long. When the boss tells you to use scare tactics,then you comply or risk getting fired. below 20 year (1993-2012) average. Another cold winter looming ahead. Oh my gosh! By 2100, the whole world is going to be various shades of red and orange! We have to raise taxes now! Just like in Spinal Tap, it goes to 11. I wonder if any of the UN conventions on human trafficking could be used against the IPCC. After all, it is little more than the world’s best-funded bordello, and while I’m sure most of the highly-credentialed, uh, talent that services their customers regard themselves as voluntary participants, one has to question what sorts of threats and pressure would keep any but the overseers willing participants in this degrading sham. What’s the climate sensitivity to CO2 in the RCP model, in order to achieve such a degree of warming? I don’t expect CO2 concentrations to double in 2100 from present, yet the average warmth in the RCP report seems quite bigger than the expected warming for a doubling of CO2 in the worst of the sensitivities contemplated by IPCC. 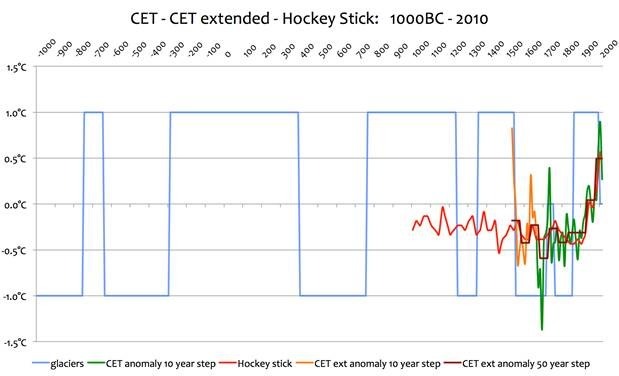 Several months ago I compiled a chart of glacier retreats and advances over the last 3000 years and graphed over it the Hockey stick and reconstructed CET to 1538. 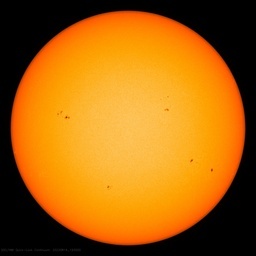 This demonstrated that climatic variability was far higher than claimed by DR Mann. When considering the number and extent of unauthorised leaking of AR5, is that in itself a sign of the faith the scientific body have in the IPPC process? Sorry, as long as the RS and APS say the science is sound, no-one who matters is listening. Many unknowns in the ‘not soon to be settled science’. i-phone is a little off but one thing I noticed is that the temperature indicating color map for the ‘late-21st-century RCP8.5’ from the Second Order draft SPM from March 2013 shows the globe warming in a rather attractive red hue with the real continental hotspots indicated by a rather pretty purple color. They must’ve had a rather heated (sorry about the pun) conversation with their graphic designer because that public relations fault appears to have been properly corrected in the final release of the ‘Approved’ Summary for Policymakers (Lawmakers and Regulators) released on September 27th. Now the colors have been changed to a more somber un appealing rusty red and deathly brown. That graph makes it look like the Arctic will spontaneously combust in 2100. I think the only difference is the change in color scheme. The estimated change over the U.S. appears to be very close, if not the same. Coming soon to a century near you, tropical beach trips to the Arctic! We’ll be luck if 2100 is as warm as 2000 was. For sure, the population will have peaked and will be heading downward. Not only will that result in a decrease in CO2 output (to the extent it actually causes a rise) is will also result in decreased outbound energy flux from human activities, and decreased albedo modification. If the decline becomes a crash, there will probably be vast reforestation like what happened starting during the 5th Century. You guys beat me to the punch. It’s too bad the general public’s not aware, the way you are, of the shenanigans this renowned leadership is engaged in. And the pathetic part is that they’re not pulling these stunts with their money (of course not), they’re pulling them with ours’. I wonder how much destruction there will be before they realize they’re in the process of killing the very own goose that laid the golden egg they’re scrambling for their own breakfast. I think this is the beginning of the end for the IPCC. How on earth do they expect get away with this? As regards the rewriting of climate model outputs, this is tantamount to scientific fraud, or at least it would be in any respectable field of science. Suddenly, the dam will burst as the cost of energy really starts to bite and the IPCC and its workings will become increasingly exposed to public gaze. The deepening red will eventually come to represent ever-increasing embarrassment, not warming. You guys beat me to the punch. It’s too bad the general public’s not aware, the way you are, of the shenanigans this renowned leadership is engaged in. That’s why a House hearing on AR5 is needed. Contrarians should volunteer to offer the committee members questions that IPCC participants should be asked, etc. I hope someone up there at the IPCC has notice that while ice in the Arctic has been melting away each summer (a consequence of heating from below) the air temperature north of 80 degrees N has not risen in donkey’s years. So what is the basis of this 6-11 degree rise? It is certainly not a projection of an existing trend. Is there a model showing ice loss with no temperature rise for a couple of decades? I have been checking on the IPCC’s search for the missing tropical hotspot (having nothing better to do) and I worked out what they did this time round. Radiosonde data show no warming/hotspot in the critical zone. If it was there, a key prediction of the GHG theory would be validated. It is not there as thousands (?) of measurements have repeatedly shown. Solution? Look North, young man. Well, not quite. The data has been ‘homogenized’ across a broader range of altitude and following this messing around, the data was declared defective and inconclusive. Pretty slick! I can’t think up stuff that nefarious. The data quality (which they just messed up) is no longer up to snuff apparently so they had to settle for an expression of opinion. Who’d-a-thought? The opinion: they have a high level of confidence that the hotspot is probably there. Y’all are free to check is out. I think I have called it right. I get the feeling the IPCC has a bunch of 8 year olds with crayons frantically coloring their visions of a planet explosion brought on by the Death Star named CO2. Except for the purple the maps look like the color of the trees here in the UP of Michigan. There is another precedent for how this bandwagon plays out and it happened in the mid 19th century when a number of people decided that the conclusion drawn by Sir Isaac Newton was so bad that it needed fixing.Unfortunately the issue remains unresolved or rather,the false conclusion is upheld out of some misplaced loyalty. Now,remember this is an observation that anyone and everyone can see without magnification equipment and it would be as common to the ancients as it is to us yet although no human being has seen the far side of the moon from the Earth there are people who will go to great lengths to ‘prove’ the moon spins as it orbits the Earth.If you can get people to believe the moon spins you can get them to believe anything including human control over global temperatures. Despite appearances,the ‘global warming/climate change’ issue is a symptom of an underlying problem that has a specific beginning with specific technical landmarks. Stop using my user name! I agree that UK may have another colder winter [ below 4C winter average] and these cold winters could go on to the end of the decade . I base my projection on what happened the 10 years after 1883 which was a period of cold winter temperature declines during the decline form max to min of the first low solar cycle[#12]. It was the first of three consecutive low cycles. There was the Krakatau eruption as well during this period but it did not account entirely for the decade of colder weather but only perhaps 2-3 years . I see that we are about in the same stage with or current cycle #24 having just passed the maximum. I anticipate AO to be negative much more during this coming 10 year period. 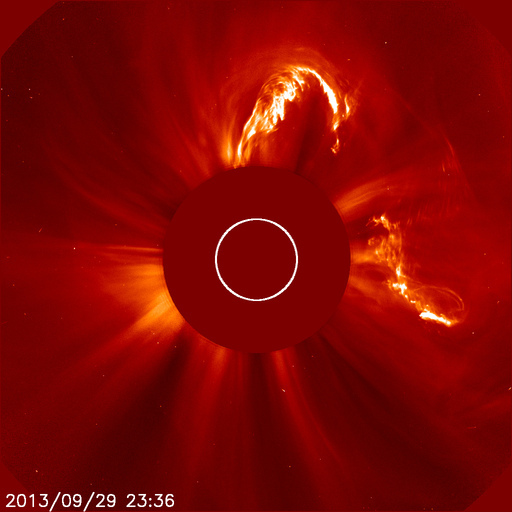 I also see sustained periods of low solar flux and more negative AO periods over the next 10 years . Ocean temperatures are also declining and so are the Arctic winter temperatures . The difference is that the trees are green before they turn, in the fall, into the color on the maps. The IPCC and its groupies are hoping for the opposite: that the color on the maps will turn into a fat green wad they’ll be stuffing in their pockets. True so very greedily true. Idiots with a color box. This shows that politics drives the IPCC, not science. Look on the bright side. They edited out the licks of flame rising from the globe to leave just as a baked brick version instead. Mike Ford @ 10:16 am said “Coming soon to a century near you, tropical beach trips to the Arctic!” Indeed! Invest in beach-front property in the Aleutian Islands now! Real-estate developers, take note that projections of global warming presents you this great opertunity. And lots of potential property tax collections for Alaska. What did Groucho Marx say? “Oh, how you can get stucco”? UPDATE: Gavin Schmidt points out on my Twitter feed that the difference comes from the two different working groups, WG1 and WGII. I wonder if both groups are 95% confident they’re right. What happens if one is wrong? One might argue that a devious group of scientists tried to get a figure out that had much of the northern hemisphere under a “greater than 6 C warming” colour, to underplay the fact that the actual projections for that region went all the way up to 11 C warming, and added colours to denote as much as 6 C cooling even though nowhere is likely to cool by more than half a degree. Luckily, the conspirators were stymied by the review process, which reverted to the figure with a more appropriate temperature scale. richard s courtney kindly provided this link to help me establish how we ended up where we are today.looking at the IPCC numbers and comparing them to the numbers here,it would appear the worlds climatologists have spent an incredible amount of money ,and spent countless hours to come up with approximately the same numbers as we had in 1896 , is this correct ? in discussion with warmists i am constantly told understanding of the earths systems by clmate scientists are improving year on year ,despite the fact the observed data suggests otherwise. to me it would appear that climate “science” has changed little in over 100 years,except more people are getting bigger paychecks for supporting a hypothesis that originated over a century ago,that to this day is still not supported by observation. What is crazy about measuring the temperature of the surface of anything is that the overall temperature may not have change at all. Take the oceans. We know there are layers of colder and warmer waters. And we know that sometimes they mix things up. Warm water rises, or cold waters get mixed in at the surface, etc. But for the most part IPCC measures the surface and goes screaming into the night that heat has been “added”. But what if it just changed places? Same thing for the atmosphere. It is layered as well. What if the heat just switched places at the surface? We should all know by now that nothing in our oceans and atmosphere are well mixed. We live in a gloppy world of fluid dynamics. Martin: Does that mean it’s louder? Is it any louder? Martin: Why don’t you just make ten louder and make ten be the top number and make that a little louder? Nigel: This one goes to eleven. ….Yeah, pretty much, except for one quibble. Even the UN projects that e.g. Bangladesh will have a standard of living by 2100 about equal to the current UK level…..
You are assuming carbon based energy sources while India and China are going full steam ahead on nuclear and that is where the large populations are. looking at the IPCC numbers and comparing them to the numbers here,it would appear the worlds climatologists have spent an incredible amount of money ,and spent countless hours to come up with approximately the same numbers as we had in 1896 , is this correct ? Yes, that is “correct” concerning ‘IPCC science’. But it is not true of real science. Indeed, because climate sensitivity is less than 1.0°C for a doubling of CO2 equivalent, it is physically impossible for man-made global warming (from increased atmospheric CO2) to be large enough to be detected (which is why the IPCC ignores the measurements of reality and only accepts the outputs of climate models). Maybe it’s an auction. They’re bidding 11C in the arctic. Seems like great news – warmer in the poles (especially at night), means more livable conditions in Tasmania, most of Europe, most of Northern Asia and Canadia. What’s the downside? The IPCC is putting to rest any doubt about their being a scientific body. They are not. They are a group that creates sales tools and stage props for the promotion of AGW. Thanks. The graph is now updated with the CET daily minimum temperatures. You need to all take a second and actually read the graphic. The temperatures are the same, they just had to increase the scale so that they could show the regions above 65’N latitudes that were going to warm more than 6’C on average annually. All other temperatures are still the same, the area that used to all be maxed out at 6 degrees is still 6 degrees until the higher resolution can show more warming as you go further northward. I would agree with you that the cooling globally could go into 2030 at least. I was just pointing out the10 year CET experience after 1883 to focus on our next 10 years. The total comparable periods are actually 1880-1910 and 2000-2030.